I have a bare wall in my living room that constantly taunts me--it is empty other than one small print. I am currently thinking that I would love to place an oversize mirror on this wall to add not only a touch of glamour to this space but a lovely focal point. Do you have a bare wall that taunts you? I had a wall in the entry that haunted me and it worked ever so well to add a mirror there. One in the bedroom that haunted me was much larger and in a narrow walkway so I painted it instead with a deep green and it has never felt empty again. This post is too close to home for me! I have a whole basement suite that is taunting me. We're moving out the end of April but, currently we're living in a white-walled space. Thank goodness we have a tonne of natural light; otherwise, I'd go insane. I love the effect of mirrors, we have one proped up at the front door. It opens up the space, tenfold. 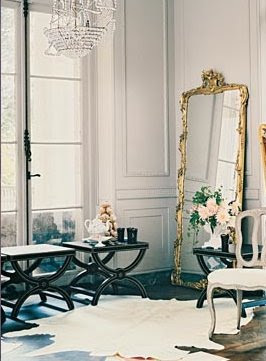 I love the look of huge framed mirrors proped against the wall. I just put up an oversize mirror over my dining table. It looks great! So definitely, go for it! 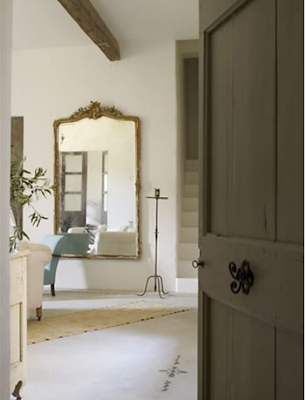 Love the whole overside mirror against the wall idea! mirrors are one of my favorite decorative pieces. i used to have a "hall of mirrors" in my old entryway and i loved it. 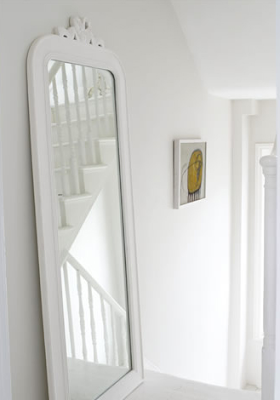 a fabulous mirror is definitely worth the investment. i found a gigantic, beautiful mirror (made in france) at a high end yard sale and talked the guy down to $50! score! these mirrors are fantastic! i *had* a bare wall and filled it up with a gorgeous oversize mirror that i got as a surprise gift for christmas. i'd been going to 'visit' it on a regular basis at the store, and someone super thoughtful realized that it'd be a great gift. Yes, I know what you mean about those walls, they just sit there and taunt you! I love big mirrors on the floor against the wall. Will you post pictures of what you decide? an amazing idea, looks stunning (as beautifully illustrated by these images) and so practical too! Marianne, I will definitley share pictures of what I decide! I have a pretty large old mirror that has a pretty bulky and not an overly attractive frame but I think with a little creatively use paint it will work well! Oh, Joyce-that room definitley sound like a struggle! I don't have space right now for one, but I LOVE al of these... especially that first one. You definitely need to post pictures of what you pick! The mirror is a very good and beautiful design element. It will make the room appear larger as well. Any of these choices would be great! this post reminds me so much of my sister's place! all these pics look so much like her place. i wish you could see it! it's so lovely! thanks for stopping by the B. i'm not back in full swing yet, but i figure i will ease back into it. it's been a while since i was here, so i have some reading to do. i've got all the time in the world now! Oh to have a wall that could taunt me! I have a really small apartment right now that is swallowed whole with pictures and prints! I love these images though, it makes me desire a blank wall all the more. I have two walls that are crying out for something - and I'm seriously considering a mirror for one of them... but which one?! I'm planning a mirror on one of my client's walls... it's going to look great! Yes! I have 3 walls that are tormenting me right now. I'm working on getting just the right pieces for them but it hasn't been easy. as a matter of fact i have many bare walls! i love the first photo....perfectly wonderful! I've just written a post on mirrors myself, and then I cruised over and read this! Some gorgeous choices here, hope you find what you want.